PNR Status of booked ticket can be checked easily. All tickets booked through Indian Railways OR IRCTC having a unique PNR number. You can enter your 10-Digit PNR Number in below box & check PNR Status. You can also check the PNR status from your mobile phone or land line. You can check Rail PNR status of various zones. These zones are southern railways, western railways, northern railways & central railways.Check PNR status of your Indian railways booked ticket. Rail PNR Status Explained: PNR is an abbreviation for Passenger Name Record. PNR is a record of travel for a passenger or group of passenger. 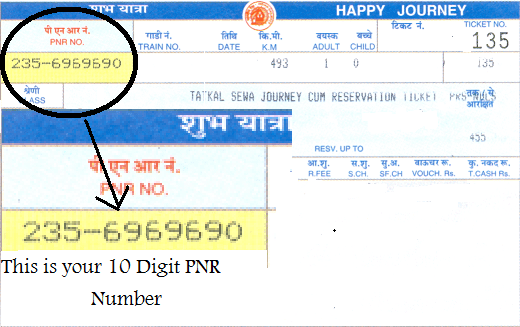 A PNR number is generated against each booking. PNR number is also generated in case of non-confirm booking. PNR is also generated for online booking or booking made through Indian Railways Counter. The PNR information is stored in the database. PNR is of 10-digits unique number and having only digits from 0 to 9. In Indian Railways advance booking is allows up to 90 days before the actual train start date. Passenger should book a ticket well advance to get a confirmed ticket. If confirm ticket is not available, Railway provides a ticket with RAC (Reservation Against Cancellation) OR WL (Wait List) ticket. Both RAC or WL ticket also have a PNR number. Reservation Against Cancellation (RAC) means a passenger does not have a reserved berth. RAC only confirm that a seating capacity will be provide for sure. Also, RAC tickets will be confirmed first against each cancellation. Depending on the number of wait listed passengers, RAC tickets will be upgraded to confirm ticket. In RAC, Railways allot a single berth to 2 passengers for sitting. RAC passengers are allowed to board the train. Ticket Checker present in the train can also allot the free seat for those passengers, who are unable to board the train. Wait List (WL) means that a passenger will not get the confirmed berth or seating accommodation. On every cancellation free berth will be first allotted to RAC Passengers. After RAC passengers, berth will be allotted to Wait List passengers in terms to their waiting number. The number of wait list for each train may vary. When maximum number of wait list will be crossed a REGRET status will come. This REGRET status define that no further booking is allowed in the train. You can find PNR number on top left corner of railway ticket booked through railway counter. PNR number is also mentioned on ticket booked through IRCTC website or any other online source. Please visit Wikipedia for more information about PNR. How to Check Rail PNR Status? You can check the Rail PNR status by Land line telephone or mobile by calling 139. It can also be checked through sending a SMS though your mobile. You can also check the PNR status on many other websites. As we told earlier you can also check PNR status by sending SMS from your mobile. It is easy to check PNR status from mobile, if you don’t have access to internet. Indian Railways also provides a service to check the PNR status through SMS. You will get an instant current PNR status on your mobile via SMS. A passenger needs to send a SMS to get the reply containing current PNR status. Below are the codes for sending SMS and checking your current PNR Status. 2.) SMS: PNR <10-digit PNR Number> to 54959. 3.) SMS: PNR <10-digit PNR Number> to 5676747. 4.) SMS: IRPNR <10-digit PNR Number> to 57886. 5.) PHONE: Dial 139 from your phone to check PNR status. You can check the information for arrival & departure, fares, accommodation & seat availability. You can also perform the query like Train Alert, Train Status, Seat Availability, Train Running Information, Train Time Table, Train fare & many more. You can check all this on your mobile by receiving SMS from Indian Railways. To get a list of all available code on your mobile phone, you can simply send a SMS TRAIN to 5676747. You can alternative visit Indian Railways SMS Service page to see the code for various numbers. Confirmed (Seat Number shall be available after chart preparation). Ticket Not Cancelled but Alternative Accommodation is Provided. 1.) Ticket booking from the Indian Railways booking counter. 2.) E-Ticket from the IRCTC website. 3.) I-Ticket from the IRCTC website. 4) Ticket booked through any travel agent online / offline. Any passenger can cancel their train ticket in case they don’t want to travel. A refund request can also be made by filing a TDR if a passenger not able to board the train. TDR can be filed only after 24 hour train reaches at destination. Some rules are applicable for each cancellation of ticket. These rules may vary depending on type of ticket. For E-tickets cancellation you can check the rules for e-ticket cancellation. For I-tickets cancellation you can check the rules for i-ticket cancellation. For ticket booked through railway counter you can see the refund rules here. For More information about the cancellation and refund charges you can visit the official Indian railways website. For filing the TDR & refund rules apply for TDR, you can visit here. Tatkal booking is the last possible way to get the confirmed ticket for your journey. It is very important the you know how to book a ticket online before booking a tatkal ticket. You can have a look on Quick Booking Guide. When you understand about the ticket booking, you can check the Tatkal Booking Guide. Their is a Magic form for fast filling the booking form while booking the Tatkal ticket. This website is nowhere linked or affiliated with The Ministry of Railways and Government of India. It does not reproduce, transmit, or store any user information or any content of Indian Railways websites in its database. Only purpose is to provide public with extended information about ticket booking and PNR status checking. For checking PNR Status or any other information you can visit official Indian railways website at http://www.indianrail.gov.in. PNR STATUSchecking only Indian railways journey’s in india when berth is confermed or not. With more focus on digital India, IRCTC is also coming up with new and improved options for easy access of the customers. Now customers can print e ticket by pnr without any hassle. Travel with public transport is safe so i have done irctc login register and if i have to go some where then i confirm Indian Railway seat availability after book my tickets. I got correct information about indian railway train status in this lost. Thanks for sharing such a nice and valuable post. The information that Indian Railways has given you is very good. You have explained all full form of the railway enquiry.all the information is very good.